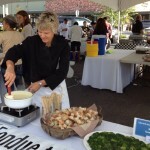 September Taste of Whitefish 2012 « Fondue To You ! Taste of Whitefish was PACKED this year! 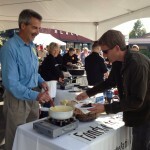 Over 500 hungry visitors toured the event sampling from caterers and restaurants. Fondue is highly temperature sensitive so outdoor fondue tasting requires endless ‘tweaking’ to stop the cheese separating……aka the stir-a-thon event!